Hot Weather Chic Because Summer Isn’t Over Yet! I know, you’ve hit the Nordstrom Anniversary Sale (or did other pre-fall shopping), and you can’t wait to start wearing your favorite fall trends. But summer’s not over yet! Here’s some style inspiration I’ve brought you fresh from the streets of Manhattan for those still yet-to-come hot days in the city. Upon arriving to Penn Station on Saturday I was met by a torrential rainstorm as soon as I got up to street level. I took a taxi with a very wet back seat to meet my friend Donilee, an amazing street photographer and former Miss Oregon. Over a snack at the Union Square Pret A Manger, she filled me in on the ins an outs of New York Fashion Week and then headed off to work. 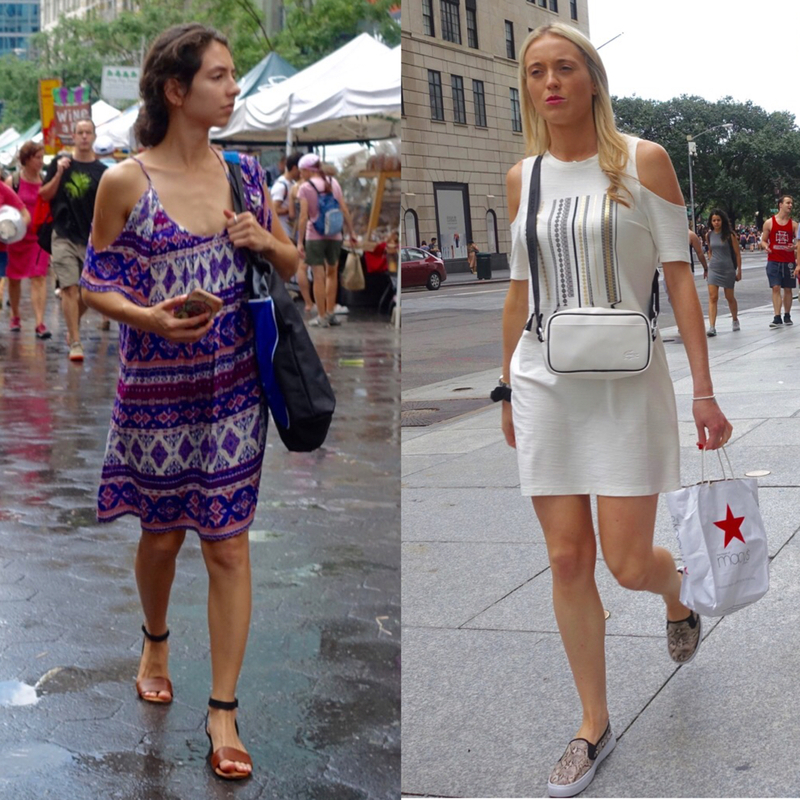 I have to say that my curiosity was piqued as I walked back on wet streets toward Union Square – the rain had stopped and temperatures were in the mid- to high eighties (29-31°C) – I wondered, “How do New Yorkers dress for this? 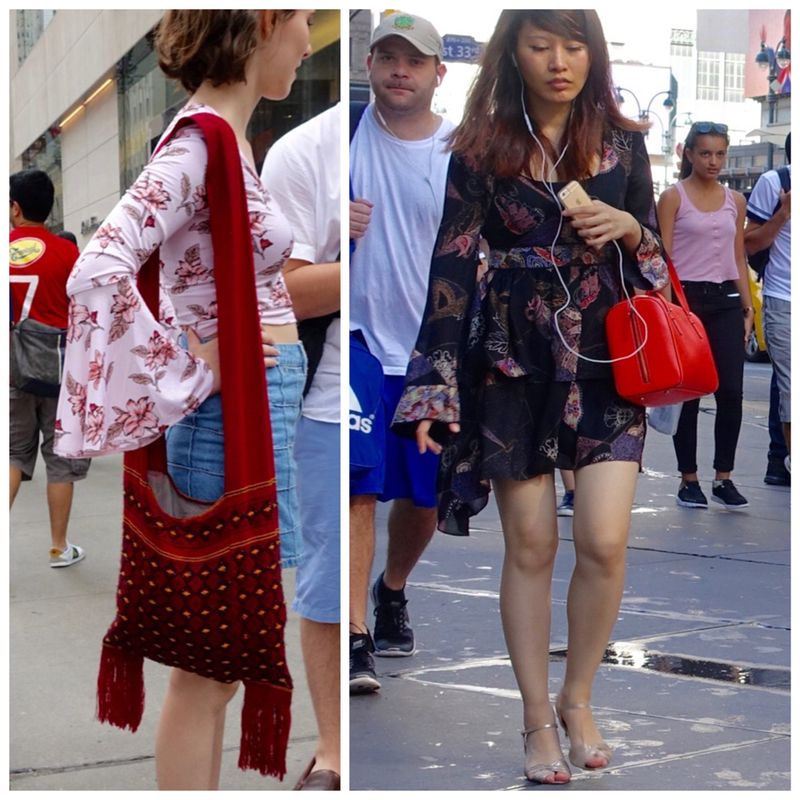 !” My sandals quickly started drying, and I realized that everybody simply dressed for a hot summer day as I had, and some street style was especially worth noting. Off-the-shoulder garments couldn’t be missed. My favorites were the dresses – how much simpler can it be to get dressed for the day? And here was a sort of surprise: a fanny pack in 2016! Forerunner of things to come? I rarely think of wearing leggings in hot weather, but they look quite comfy here with a loose sleeveless tunic/tee and gladiator sandals. 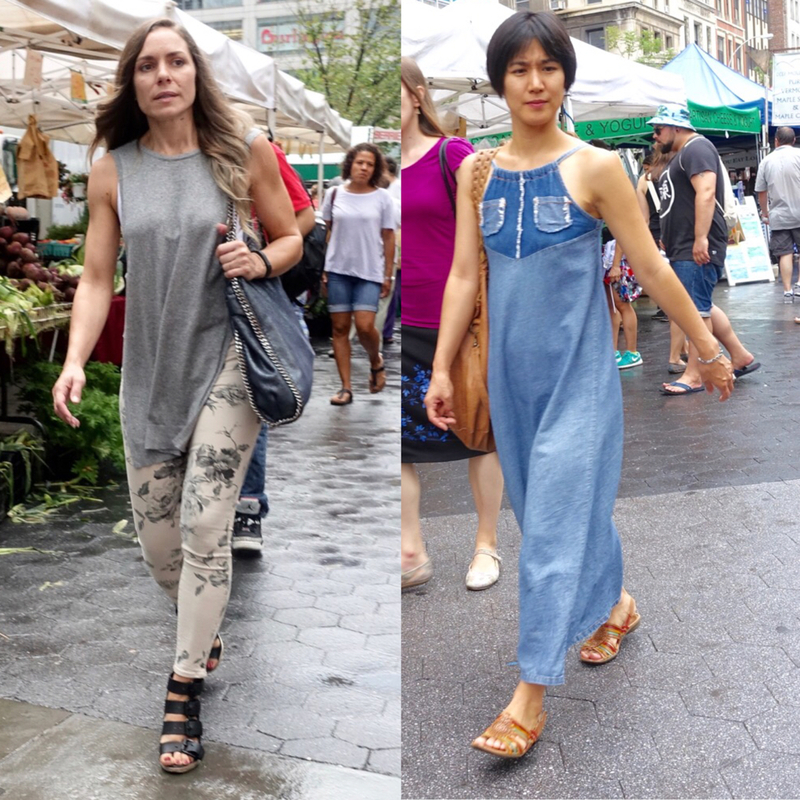 And I had to admire this maxi dress – always great to see denim worn in non-basic ways. along with more bell sleeves. I loved this LBD with ruffles – so on-point, as well as this open-back little white dress. Both looked super comfortable – and who doesn’t like easy? – for a hot, humid day in the city. Slip dresses have been on trend for a while now, but I did see some in a velvety fabric (predicted trend-to-be). Judging from some of my favorite street style from this past weekend, I suppose you don’t actually have to wait for cooler weather to begin sporting some fall trends. Which is your favorite look? Hope you’ve enjoyed the show as much as I did! Everyone who talks about street style in New York should take into consideration that there are people from all around the world here, and photos will vary according to the spot from where you shoot. Fortunately, you chose the right places, and your photos are excellent. Thank you, David! You are right. I heard so many different languages during my shoot. Although I wrote about how New Yorkers dress, I suppose I might have gotten a photo or two of a tourist. 😉 It seems that a favorite hangout for locals is the Union Square farmers’ market, and I was lucky to get some nice shots there.